The Classic Theatre was opened at 310 Main Street by Willis Norton in 1913. It became the Bonnet Shop and the Classic moved to 308 E. Main St. and part of the building to the rear of the Bonnet Shop. Steve Lind and family operated the Towne Cinema from November 2004 until December 2010. It was announced in May 2011 that Rosebud Entertainment LLC. would take over operations at the theater. The theater closed on January 16, 2012, which marked the end of operations by Rosebud Entertainment LLC. It reopened February 10, 2012 under new management. We love this theater!!! It is small and friendly with very nice staff and responsive, attentive management. All that AND movies at reasonable prices. And the BEST popcorn around! I love this theatre. They have lower prices and still show newer movies. 2 of the theaters have gone digital and have superior sound systems. The people there are courteous and friendly and make you feel at home. Mamagement keeps coming up with themes and programs that make it fun and interesting. We love Towne Cinema! It may not be as high tech as the mega theaters, but that is part of the charm and allure. At the prices most theaters charge for admission, the average family cannot afford a night at the movies. 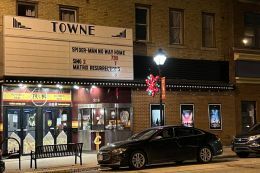 Towne Cinema is a very "family friendly" theater, with very reasonable ticket prices and concessions at or below big theater prices and at better quality. I just called the # listed and it is disconnected. This movie theater is near Johnson Creek, Watertown, Lebanon, Ixonia, Clyman, Helenville, Reeseville.